 Developed By : CyberDefender Corp. 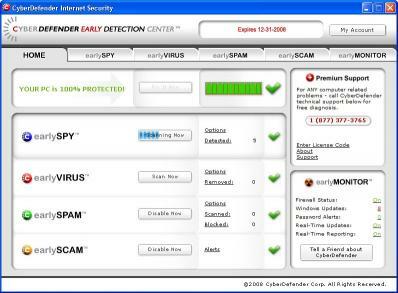 Looking for Internet Security Protection Internet security suite from CyberDefender will scan for spyware stop spam remove viruses block phishing scams and shred virus-infected emails. This is complete security software solution combining an easy to use program with effective tools. CyberDefender Internet Security takes a community approach and network detection for quick responses and protection.You get all of these easy-to-use features with CyberDefender:- Catch More Spyware. Stop It Faster- Provides the latest updates as they become available- Prevents malicious websites from changing your home page- Removes and quarantines unwanted threats and programs-I dentifies and removes Spyware and Adware that can hijack your machine and steal your personal information- Works while you do - with efficient scanning- Allows you to restore deleted programs- Patches - Informs you when a Windows update is available up to two days earlier!- Firewall Vulnerability - Lets you know if your firewall is protecting you from external sources attempting to access your computer- Cookie Viewer - Allows you to see the number and type of cookies saved to your PC- Passwords - Identifies passwords on your computer that are susceptible to theft from hackers spyware and other threats- Provides the latest updates as they become available- Removes and quarantines unwanted Viruses and programs- Works while you do - with efficient scanning- Blocks unwanted or even dangerous spam from your Outlook or Outlook Express inbox by focusing specifically on emails with dangerous payloads whether spyware viruses or phishing attacks. 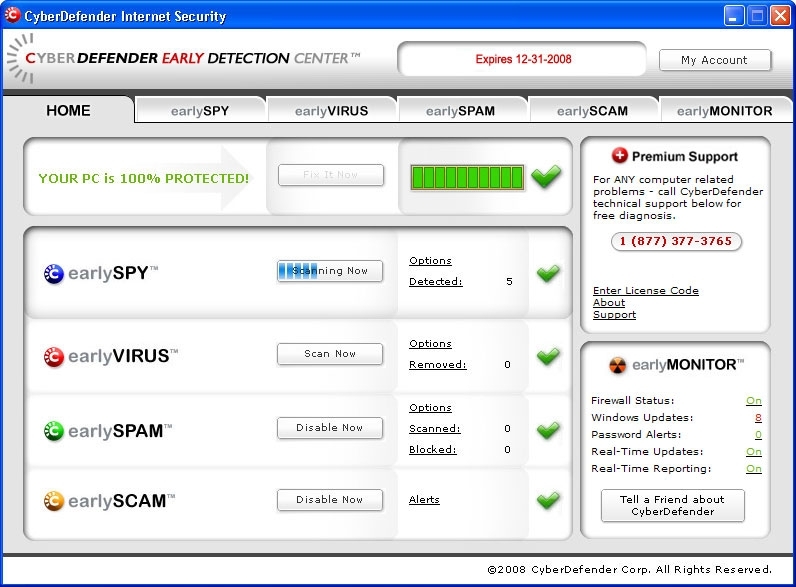 This kind of spam isnt just annoying - its criminal- Every CyberDefender-protected computer monitors and intercepts unknown threats and alerts the Early Alert Center- SCAMs anti-phishing technology analyzes every website.Download CyberDefender Internet Security now to get 100% protection of your PC!